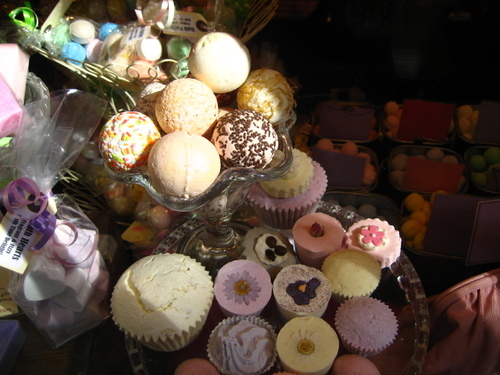 .....bought from this beautiful shop where the smellies are all handmade to look like cup cakes, icecream and sweets. 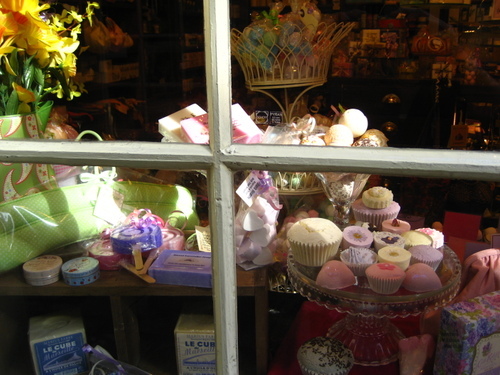 I wasn't brave enough to go into the shop to take photographs, but you can get the idea by glimpsing through the window with me. Eye candy indeed! My morning shower has been transformed into a fruity, cherry experience and the bathroom smells deliciously of cherries all morning. The Little People have instructed me to buy a green one next (lime and kiwi). I don't need much encouragement. 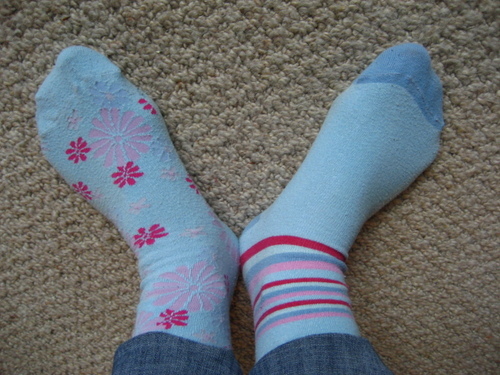 I love my socks, especially my blue and pink ones. I am not generally a shoe wearer :: In summer I live in flipflops (last count six pairs, all different colours) and in winter I wear boots (last count one solitary pair, worn day in day out). And boot-wearing means that my socks are not on public display, which means they can clash horribly with my clothes, and can also be odd. My socks make me smile when I ease my boots off at the end of a long day because they are so me. I took this photo a few weeks ago one morning before school. I had been sorting the clean laundry in search of a pair of socks and had the "help" of the Little People. Actually to be fair, they are usually very good at sorting the laundry, even if last time Little Man did charge me 20p for his laundry sorting services. This particular morning, we had a Sock Situation. Little Man "Mum I want you to wear the stripy socks today"
Little Lady " noooooooooo, wear the flowery socks!" Little Man (loud) "NOOOOOoooo, you have to wear the stripy ones!!" Little Lady (earsplitting) "NO No NO!!!!! I REALLY want you to wear the flowery ones because I like them the best"
Me "Ok, I'll wear one of each." Stunned silence. Then loads of laughing as they watched me put them on. Result. I have my Dad and his partner staying with me all this week. They came up by train from Dorset on Saturday, causing something of a shockwave as I had their arrival date written on the calendar as being next Saturday. Oooops. This is not unusual for me to make such a monumental mistake, I am often very out of touch with reality, often think things are happening a week later than they actually are. But it is still a mighty shock when I find myself so caught on the hop. Picture this :: 6.30pm, me sitting happy and relaxed at my wonderful in-laws having just stuffed my face with barbeque food. A text message comes through on my mobile, saying "the trains are running on time, we'll be at he station in 40mins". I read it three times before reality hit and then I think my word was something like "argrrrrrrrrrrrghrghgggghghhh-oh-my-god". I had a mental image flash through my mind of the state of my house, the un-hoovered floors, the un-washed piles of dirty dishes, the un-tidied chaos in every room, but in particular the state of the Attic/guest accommodation. Can you imagine the look of horror and panic that crossed my face? My in-laws nearly wet themselves laughing when I revealed the mistake I had made. J was not so amused. But it was all ok of course, we drove quick smart to the station (via the shop for a box of wine and some hasty supper material) and just made it in time. Picked up my family members, came clean about forgetting they were coming, and when we arrived home I managed to hussle them quickly through the untidy house and out into the back yard to sit and consume wine and food while I dashed upstairs to make the attic presentable. All I can say is thank the Lord for extra large eaves storage. And wine. Isn't this the sweetest little road you ever did see? It looks as though it belongs to a farm but it is in fact a normal road, albeit a small, dinky, lamb-encrusted rural road. We love this piece of road, the opening of the gate, the slow drive to accommodate sheep and lambs strolling across at their leisure. 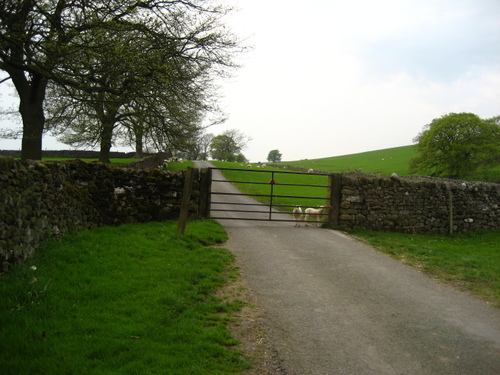 These photos were taken on Saturday afternoon, it's the road we take to visit Bolton Abbey :: there is a quicker road to take but we like this lamby gated one best. 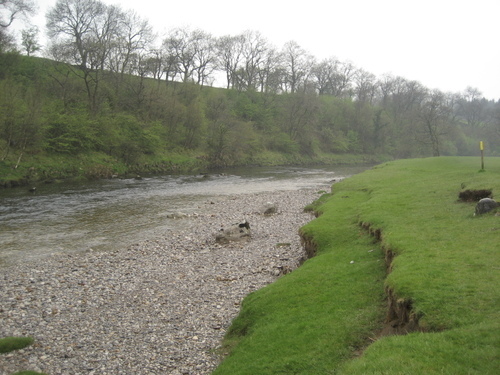 Bolton Abbey is a very, very popular part of the Yorkshire Dales. Its kind of countryside visiting made easy. 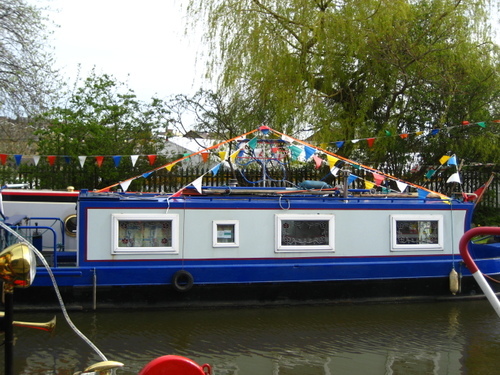 There is ample parking, toilet facilities, a cafe and a shop. Easy walking, carefully measured out and signposted routes for you to follow. 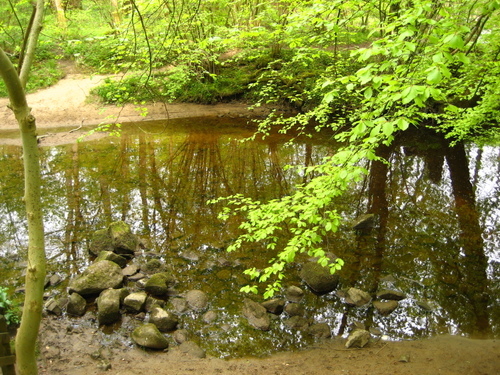 No poo or mud, no stiles, no tricky paths. 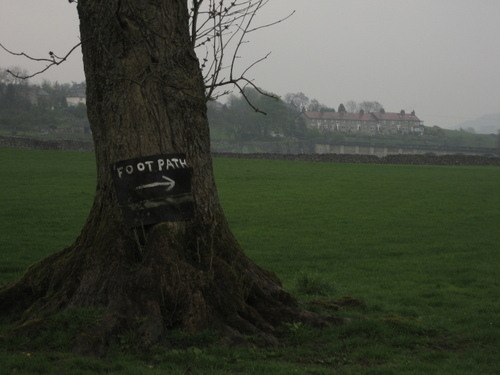 You can walk the paths in high heels if you so wish (and believe me, folk frequently do), no walking boots required. The downside to all this easily available nature is the crowds, it gets seriously congested at weekends, absolutely chocablock rammed with picnickers and weekend strollers. But nevertheless, sometimes we like to take the easy option and come here with the masses for a quick afternoon stroll or riverside picnic. And can you blame us when the views are this good? 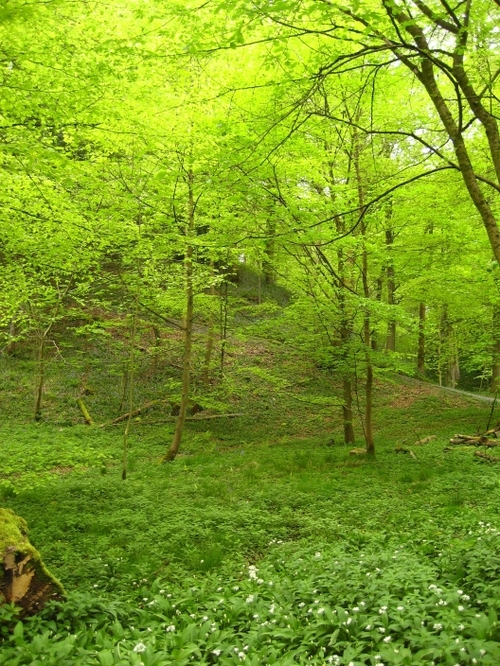 Have you ever seen a more greeny green lot of greenery?? 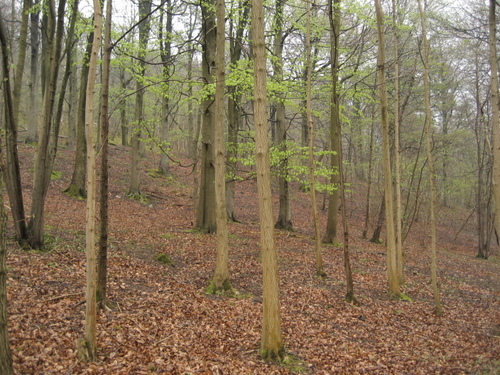 This is a combination of fresh wild garlic growing on the ground and freshly unfurled beech leaves on the trees. It was absolutely breathtaking, the colour was dazzzling. 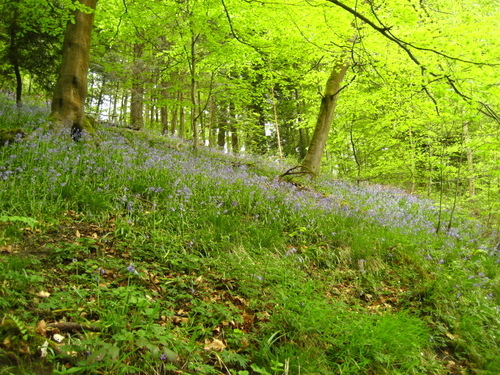 The bluebells are just starting to go over but there was still a beautiful bluey purple haze in some parts of the woods. 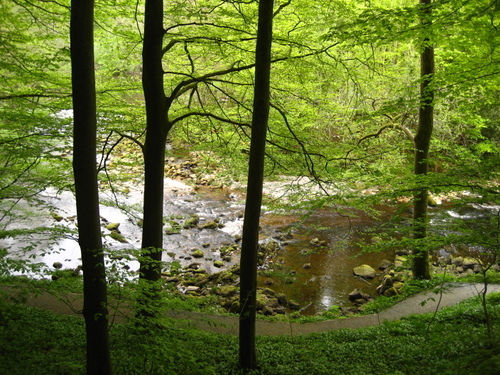 And the river Wharfe bubbling its way along, beautifully reflecting the trees. After our short stroll, we settled down with the masses by the river for a spot of afternoon tea. As we were taking it easy and not venturing very far from the car we abandoned our faithful picnic blanket and took things up a notch :: out came the folding chairs and our little folding camping table. 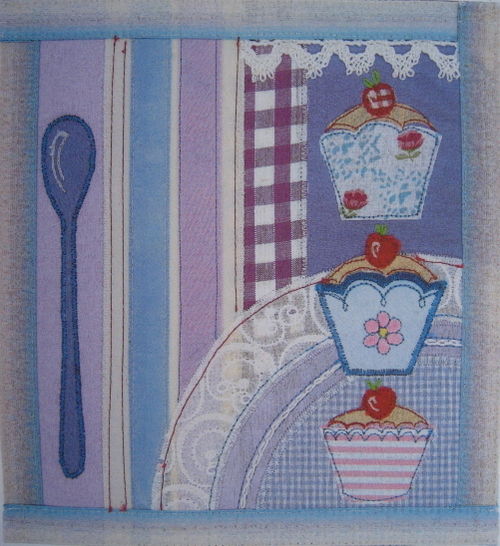 A little table cloth, plates, napkins and mugs. Fresh brewed tea and lemon drizzle cake. Yes it was crowded, a bit like taking afternoon tea in a car park. But a very beautiful, green car park at that. 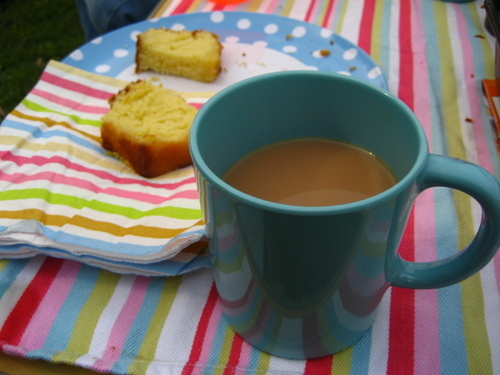 And the tea and cake was gooood. No doubt about it. This crochet thing, I just can't get enough of it these days. 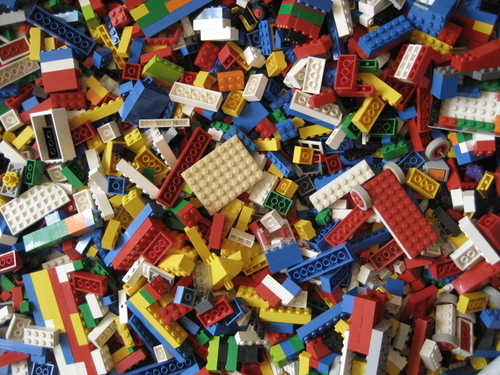 First there were squares. 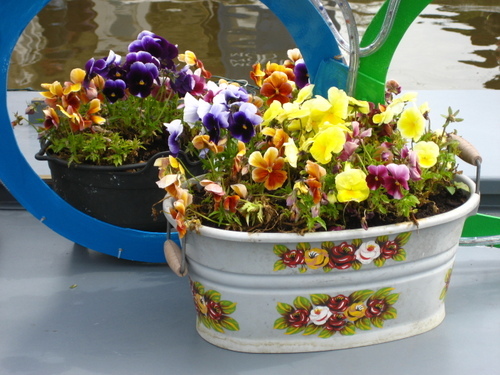 Then came the flowers, hearts, stripes and ripples. And now ta-dah let me present to you the Hexagons! I know, I know, but what about the ripples I hear you ask? Weeeelllll......I am still faithfully working on the ripple blanket, two rows/one colour stripe every evening, more at weekends if I can manage. I have this lovely little routine going :: after my delightful Little People are safely tucked up in bed, I spend about half an hour doing jobs, you know, tidying up a bit, sorting the laundry, getting stuff ready for the next day. Then around 8.30 when all is still and peaceful, me and the ripple hang out together in my bedroom chair next to the window. I feel the breeze blowing in and ripple, ripple, listen to the neighbours children still playing in the street, ripple, ripple, notice the gradual fading of the light, ripple, ripple. It takes me roughly 45 minutes to ripple two rows/one stripe and I can just about manage to do it before the daylight fades away to dusk. I have taken to sleeping with the ripple on my bed so I can see it when I wake up, it has become a bedroom blanket for sure. It's too big now for discreet hooking out and about, it likes to stay on my bed and not be bundled into a bag anymore. Sooooooo. I needed to start a new portable project that I could take out and about, crucially to my Knit and Natter mornings. 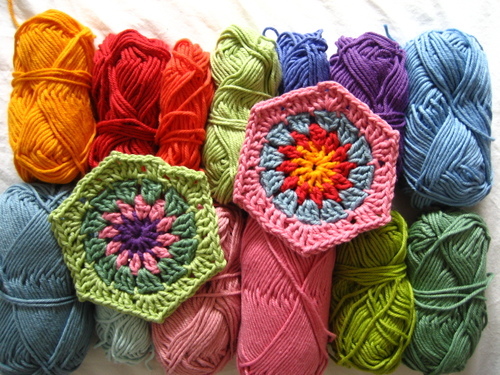 I did wonder about more granny squares and drew up a plan for making a Babette blanket. But then I discovered the Hexagon Love on Flickr and was smitten. Absolutely bowled over by it. For a colour junkie like me, the possibilities of creating such a colourful piece of work is giving me the jitters, I am so excited about it. I love the idea of so many small shapes coming together to make one magnificent whole, the joy of using colour in this way almost like mosaic. Of course I am using my trademark zingy brights, I already had about 14 or 15 colours of Rowan dk cotton sat waiting in the box, just begging to be hooked into hexagons. But what finally gave the hexagon blanket the edge over the Babette was when I found out there was a method to join hexagons as you crochet them, meaning no tedious piecing together for 200+ shapes at the end. Oh joy! The spread of hexagon love through Flickrville and Blogland has been largely due to Alex of Moonstitches. Her hexagon blanket on flickr is awesome, take a look here. And her generosity in sharing the precious joining method, oh my goodness, words fail me. I know I've said it before, but honestly this creative blogging community gets me soo excited, it's amazing in the way it allows us to share ideas and information don't you think? I am so very, very glad to be a part of it. I tell you I could not wait to get started on this project. I studied all the images in the hexagon flickr pool, searched through endless patterns on the internet but could not find one as nice as the one that Alex used. So I sat up in bed one night till the early hours with my baby laptop, my yarn and hook, scrutinising Alex's pictures and trying to work out the pattern for myself. I made a few mistakes, had to tweak the sticthes a bit to suit my yarn, practice the joining method a bit, but I eventually sussed it out. And forgive me for sounding smug here, but I was really damn pleased with myself!! 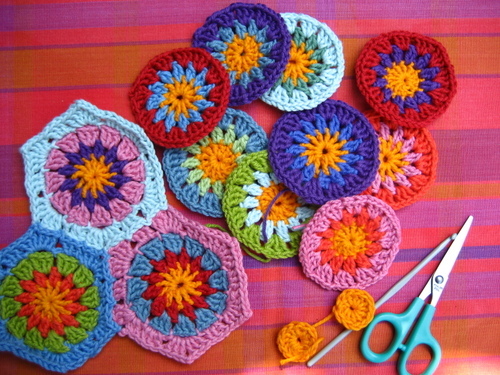 I love the fact that before the hexagon shape is formed in the final joining-together round, you start out making these gorgeous flowery circles in three quick rounds. I've decided to keep all the centres yellow like daisies, then randomly select the other colours as I go :: it's so satisfying seeing this little colourful yarn-garden begin to grow and bloom. Like yesterday morning when I was Knitting and Nattering and drinking cappuccino in the cafe (yes, it's a hard kind of life I lead) I manged to turn five little pre-hooked yellow wheels into blooming flowers. Its going to be one heck of a blanket when it's done. Blooming marvelous I tell you. 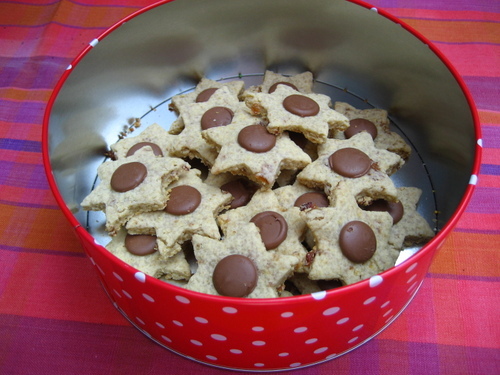 I baked some oaty stars this morning, it's one of those recipes that I always come back to when I need something quick and easy ready to hand out to the Little People. 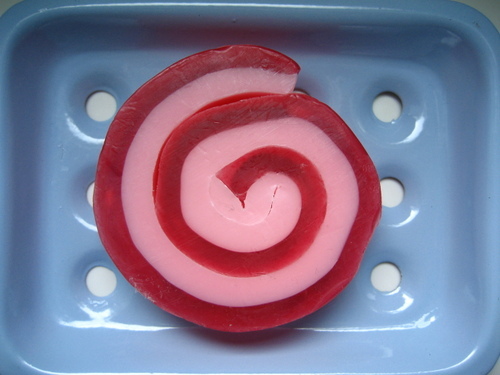 They love these, either tucked into their lunchbox or after school with a glass of milk. Actually, the after school snacktime in our house is something of a major daily event :: it seems to last for about 2 hours and involves all manor of demands, declarations of starvation, raids on the fridge and fruit bowl and general all-round harassment. 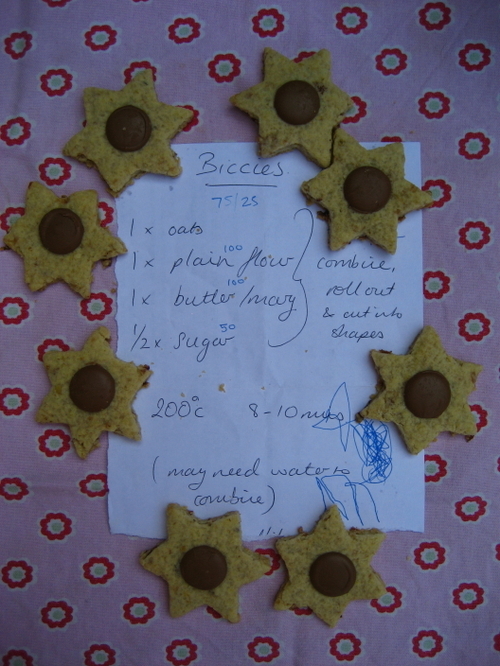 This recipe was given to me by a friend who used to host NCT coffee mornings when my two were still toddlers. 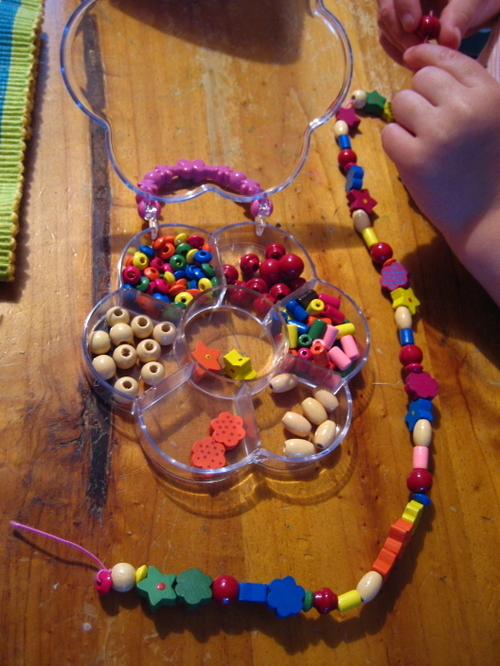 She often used to have these on offer and they were always a hit with both mums and tots. In fact, my two notoriously used to snaffle great handfuls of these cookies and could then be found hiding under the stairs stuffing their little faces. She scribbled down the recipe for me on a piece of paper which I keep in my recipe file, and it always reminds me of her (thanks Josie). In case you want to give it a go ,the quantities I've written in blue pen make about 24 biscuits. So it's 75g oats, 25g sultanas, 100g butter/margerine, 100g plain flour and 50g sugar. I put all the ingredients into a food processor and whizz it up to combine, it's honestly as simple as that. My oven is hot so I tend to bake at 180C for about 9mins. Today I tried a new variation with the addition of chocolate buttons, which I thought was a slightly brilliant idea. So when the biscuits came out of the oven and were still hot, I popped a chocolate button on each so that it melted slightly and stuck once the biscuits cooled. Good eh? Incidentally, one packet of chocolate buttons does actually contain exactly 24 buttons, so don't do what I did and start absent mindedly eating the buttons as you're baking because then you won't have enough. Just saying. 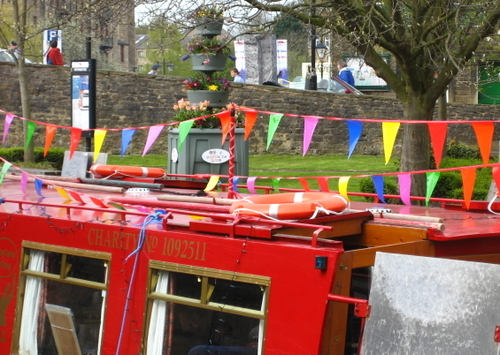 A walk along the canal to see all the boats that had arrived for the annual Waterways festival. 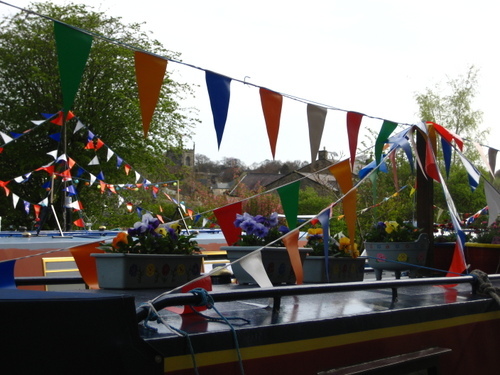 There are usually a fair few boats along the bit of canal where we walk, but this weekend a lot more had sailed in and they were all dressed up for the occasion.I love, love, love the colours in these pictures, almost every boat was decorated with jolly bunting flags and many had wonderful tubs of flowers on the rooftops too. It was bustling and cheerful, colourful and happy. 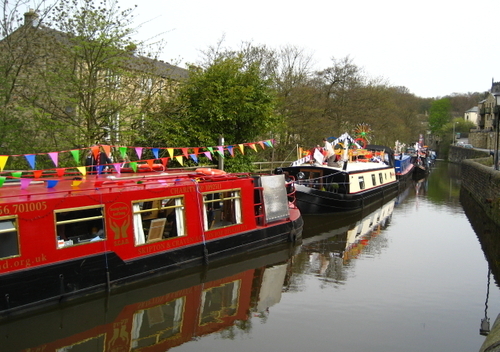 There was to be a "twilight illuminated cruise" that night with all the boats lit up with fairy lights sailing down the canal. The Little People were desperate to go and see it but we were doubtful they would have the energy to stay up until 9.45pm. But as it happened, the little street where we live is inhabited by some very sociable families who take to their small front gardens in warm weather (we are only just finding this out as we moved here in Winter when folk were tucked up indoors). And it doesn't seem to take a lot for a little impromptu street party to form. So we found ourselves out in the street on Sunday evening, the Big People drinking and chatting while the Little People played together in a big laughing chattering gang. And as the evening wore on and the light faded, we all walked down to the canal together to see the boats and the lights twinkling and reflecting in the water. It was quite magical. About once a month J and I manage to escape the responsibilities of parenthood for half a day and head off into the Yorkshire Dales to walk. We have this book which has had some serious hammer, I think we first bought it in about 1994 not long after we met and discovered we both enjoyed walking the hills. The walks in the book are all circular and vary in length from 4 to 10 miles :: we have done some of them dozens of times over the years in all seasons and all weathers and always look forward to doing them again. But this rainy Sunday was to be different as instead of the two of us, we had decided to take Little Man along with us for the first time. We had managed to buy him some second hand walking boots and he was raring to go, bouncing around like a puppy, full of anticipation of doing a Big Walk. It was such a shame that it was so wet, in fact it didn't let up for the whole six miles. But despite the wet stuff, we still enjoyed it enormously. Enjoyed the drippy wet picnic lunch in the woods, and the soggy wet meander along the river, and the squelchy wet walk over hills and across pastures. Monday was our pyjama day indoors for the most part as it was grey and cold and we felt the need for house rest. But miraculously by early evening when we had tired of crafting and playing and film-watching, the weather actually wasn't half bad. 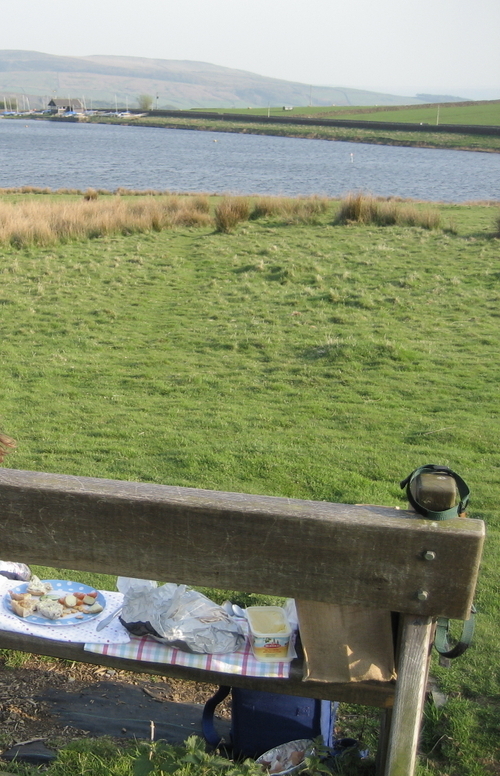 So around 5pm we packed a swift picnic and headed to a nearby reservoir for tea. There's a bench about half way round which looks out across the water to the little boathouse. It's breezy here, but the early evening light is magical and we enjoy a lovely dinner of quiche and salad with crusty sunflower seeded bread. Finish off with a cup of tea and home made rock buns, then walk the rest of the way around the water watching the boats skim across. Then home to get back into pyjamas and oh yes :: lets light a fire....oh the joys of a real fire! I'll tell you more about our new fire another time, but let me tell you we are loving it enormously. 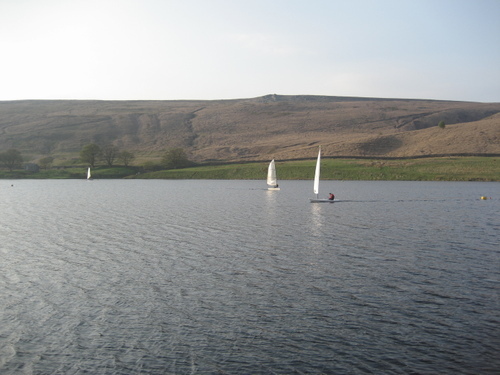 I mean, its wonderful being out and about, canals and rivers and reservoirs, hills and woods and pastures. But its heaven to be home at the end of a long weekend of outings and weather, sitting by the fireside feeling warm, cosy and content. And Home. I love the few bank holiday weekends we have in this country, there's something wonderfully optimistic about the promise of a Long Weekend, the planning, the hopeful second guessing of the weather. Similar to Easter, the weather in our part of the country for the May Day weekend was incredibly mixed. We had some warm bits, cold bits, cloudy bits, sunny bits and quite a lot of down right wet bits. We did venture out in the wet bits, but for quite a bit of it we stayed pyjamma-ed and indoors doing leisurely weekendy things. 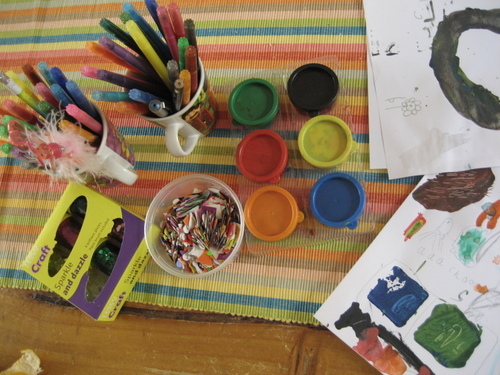 Lots of crafting and playing, which I have to say I really enjoyed for the most part, although clearing up after the painting and glitter session was not too much fun. The Little People settled for beads and Lego. And I split my time between hooking and crochet. 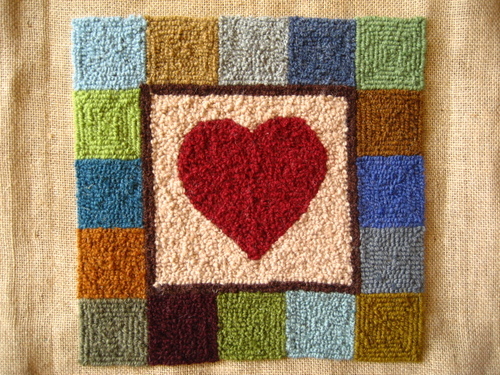 I finished my hooked heart design which I'm really pleased with, and can't wait to get it framed. I've still got quite a bit of wool left so I'm planning on making a matching picture with a hen in the centre. 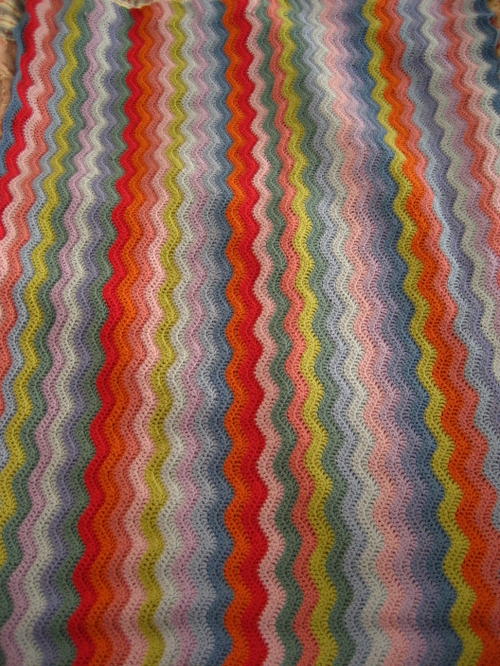 And I did five whole stripes on my ripple blanket which is more than I've managed in ages. I think there's about 43 stripes now so I'm almost half way and still enjoying it very much, especially as it's big enough now for me to snuggle under it while I work on it. The fun never ends in our house. Firstly, just before I launch into a whirl of crochet talk, can I say a huge big Thankyou for all the Birthday wishes that you sent for my little four year old, I was really touched by all the comments. Thank you thank you. 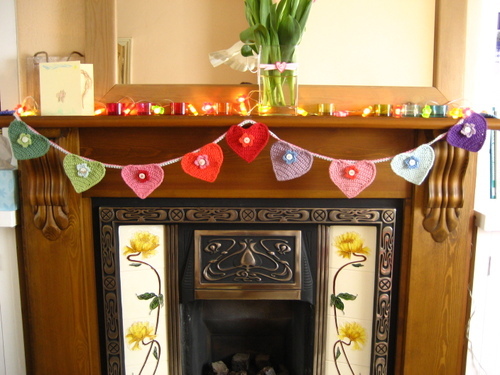 Several of you have asked about the crochet hearts that I strung on my mantle for the birthday celebrations, I had forgotten that I made them pre-blog and so had not had the chance to share them with you when I was making them. 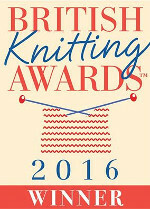 The yarn is Rowan DK cotton, fifteen luscious colours of it. I love this yarn very much, it's soft and easy to crochet with, but it's the colours that make me want it so much. 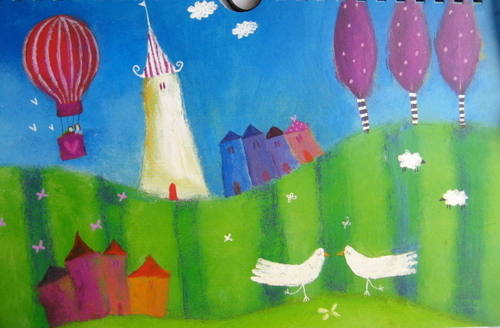 They are beautifully saturated and deep, even the pale colours have depth to them I think. And the Sweet Heart pattern is available for you all to try, you can find an extremely generous tutorial on the lovely Bella Dia's blog here. As soon as I saw them I knew I had to try them out, they are just the sort of decorative thing I love to have around my home to bring colour and a smile into the room. They're fun to make because they aren't too big and you can finish one relatively quickly :: instant gratification. But be warned, once you start, they are addictive. 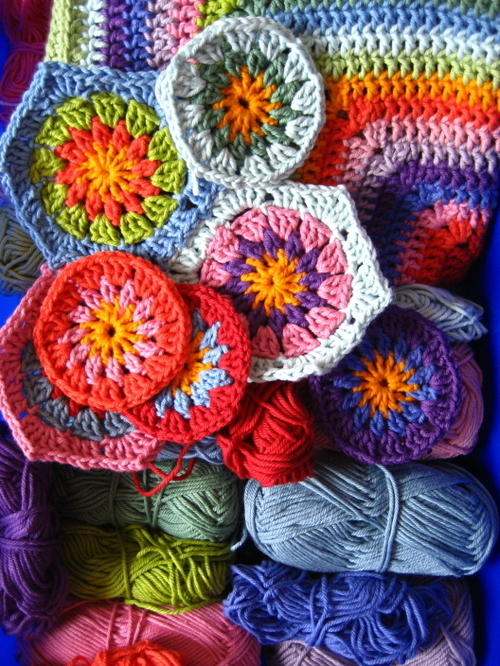 You will be crocheting them in every single nook of spare time in your day. Just a quick heart with a cup of tea. One more whilst the dinner is cooking. And oh just another quick one before bed. I know Jane from the Posy blog got caught up in the sweet heart addiction (did you finish the garland Jane?). I decided to make little crochet flowers to add to the hearts with shell buttons, I tried a few patterns for flowers from the internet and a book but they were all a bit too big and complicated so I ended up inventing my own small five petaled flower pattern. Aren't I just the crocheting pro eh?! And to finish off I crocheted a long string to hang them from (make a long chain, then sc a row in contrasting colour). Eh voila! One pretty decorative garland for ones home. Sweet. Good afternoon! I only realised this morning when sorting out some papers for Little Mans school that we have kissed April goodbye and are now breezing into May. I know I've mentioned before how I love my calendars and really look forward to the first day of each month when I can turn the page and gaze upon a new picture. I think May on my Laura Ashley calendar is beautiful, both the colours and the design so pretty. I've come across an awful lot of cupcake love in Blogland and Flickrville, just look here and here for real ones and crafted ones to see what I mean. And I can understand the love, yes indeedy, the colours, the design possibilities and the delicious indulgence of cupcake eating all come together in one big sweet pile of lovliness, mmmmmmmmmmmmmmmm. So yes, here we are in May. I saw my friend in passing this morning and as we were chatting about the weather and the fact we were now in May, without warning she pinched my arm and then punched me!! Yes, I was in total shock for a split second, thinking she had totally lost the plot before she uttered the words "Pinch, Punch, First of the Month". Oh, how I laughed, my goodness, I have not heard this said for so many years but remember it very well from my own childhood. Haha, it really did make me chuckle, the unexpectedness of it. In case you are wondering what on earth I am wittering on about, read here for a quick explanation. Must remember to get her back on the first day of June, will write it on my calendar "Remember to pinch and punch Katherine". Well my friends it's been a while since I showed you my view and gave comment on the weather here in North Yorkshire. I continue to be wowed by these gorgeous hills, and surprised by the endless changes of the weather. The above photo was taken at 7.15am this morning :: grey, misty, cold and rainy. 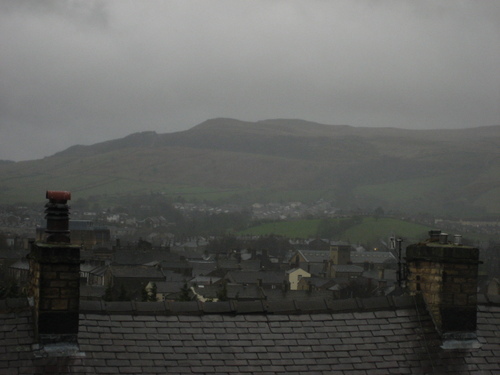 Pitter patter on the Attic24 roof, big coats and wellies back out for the wet walk to school. 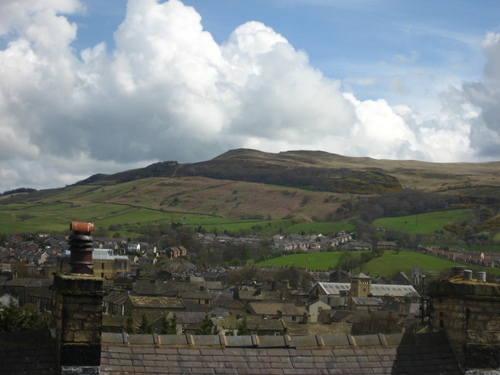 But by mid morning the rain had stopped and the sky cleared, and the photo below was taken at lunch time :: some blue sky, intermittent sunshine and those big pufffy white clouds, a bit more what one would expect from an English May day. Which was fortunate as I had a date with a chimney sweep this morning, which would not have gone so well in the rain. Oh GREAT big huge excitements in our household as we are are preparing to get rid of a nasty electric fire in favour of a real, burning open fire. I am waaaaaay beyond Thrilled at the prospect, almost bursting with excitement in fact. The chimney sweep was a sooty wonder and thanks to him and his incredibly looooong brushes and ladder, we now have a swept and repaired chimney, and a newly installed one hundred year old chimney pot. All we've got to wait for now is a minor repair to the fireplace itself, and the ironmongery that's needed to burn logs and we can light up.....I am imagining myself at the weekend in a scene like this one. Heaven indeed.